In 1855 Gary's great, great, great-grandfather, James Pattison, settled from Scotland in an area just miles from Ormsby. He eventually moved his family to the nearby Ridge farming community where there has been a Pattison family presence ever since. Rita and Russell Pattison's twin boys, Gary and Ernie, were born near Timmins in Matheson, Ontario. They spent a great deal of their childhood in the Bancroft area where their father worked in the local uranium mine, and spent summers on their aunt and uncle Leona and Leo Campbell's farm at The Ridge. They discovered music while attending school in Toronto and have juggled performing careers with life in the Bancroft area ever since. Ernie opened and operates The Old Ormsby Schoolhouse “Educated Dining” & Tea Room in Ormsby’s original one-room school across the road from The Old Hastings Mercantile & Gallery. At The Four Seasons Centre for the Performing Arts. Gary met Lillian at a local church anniversary service when she was singing with the group, 'Close Enough'. They quickly developed a shared passion for music and for each other. After many years managing three homes (Toronto, a farm on The Ridge and The Wilno Craft Gallery) they bought the old Ormsby general store on Valentines Day in 1997. They worked as best their hectic schedules allowed to revive the building and create The Old Hastings Mercantile & Gallery. Gary's music career has been busy from the start and shows no sign of letting up. 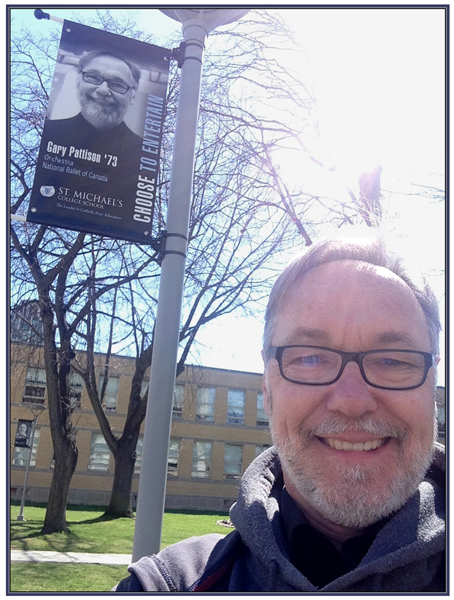 After receiving his Bachelor of Music from the University of Toronto Gary continued studies on the french horn in Europe while quickly establishing a presence in the free-lance scene in Toronto. His on-going commitments include horn with The National Ballet of Canada since 1976 (Principal Horn 1978 - 2016), The Esprit Contemporary Music Orchestra since 1988 (Principal Horn 1988 - 2015), and 2nd horn with The Canadian Opera Company Orchestra since 1999. He has played for just about every major musical that has come to Toronto (from 'Cats' to 'Lion King') as well as hundreds of recording sessions for movies, TV, commercial jingles and albums. Gary has played and recorded with The Boss Brass jazz band and in the stage orchestras for major visiting entertainers. Gary and Ernie Pattison, the early years. At St. Michael’s College School, where a banner celebrates his career with The National Ballet of Canada.